Birmingham, Alabama’s transit agency, the BJCTA (Birmingham-Jefferson County Transit Authority) has a website for tracking the buses in real time. This website along with their mobile app are ok, but have some things that constantly annoy me. My biggest annoyance is that every time the App is brought to the foreground, it refreshes and resets you back to the main page, losing the bus you were trying to track. The other problem is that you can only view one route at a time (at least on the mobile app). I have 3 routes that I can choose between every day. When I open the app, I want those three routes selected by default so I can quickly see which route to pick. With that, I present to you Montclair. 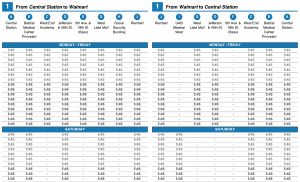 My previous blog post (Visualizing the On Time Performance of Birmingham’s Bus System) looked at creating visualizations based on the real time data provided for Birmingham, Alabama’s public transit system. I have now created a simple, public API that can be used to query the historical data captured from the real time system. Using my dv8 scripts, I am capturing a snapshot of the real time data every 30 seconds. I am then storing this data in a sql database, so that we will have a historical database. 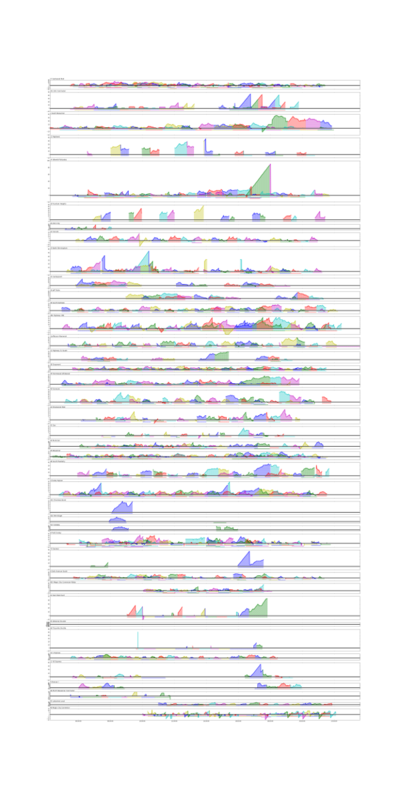 This allows for generating reports and visualizations over time. As of writing this, I have about 2.5 months of data captured. This returned a list of all the known routes and their properties. Each route also has a set of “Trips”. A trip is a unique instance of a bus running along a route. For example, if everyday at 4.00pm a bus leaves Central Station along the route 44 and arrives at its final destination at 5.00pm, this would be a Trip. We can get a list of all the trips for a specific route. Based on the previous query, I have found that the “44 Montclair” has an id of 21. This returned all 61 trips associated with the route 44. Unfortunately, this doesn’t give us that much information about the individual trip. 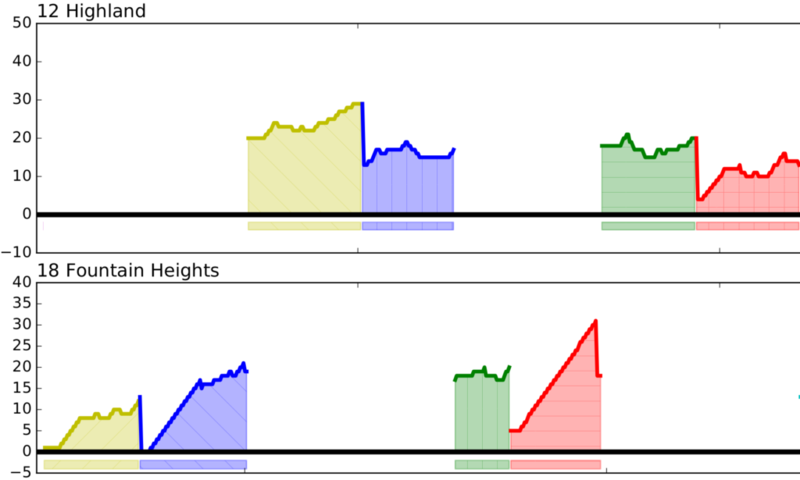 For instance, we have no idea based on the returned results what time of day a trip runs. For every trip, we can get a series of “Waypoints”. Waypoints are all the known information about a bus on a trip at a given time. They are essentially a snapshot, showing the location, passenger count, time deviation, and various other details. We can pick a specific trip and query it. On this date, this trip was an Outbound (0) trip. It left Central Station at 11:45:00 AM and arrived at Eastwood Mall on time at 12:21:00 PM. We have samples every 30 seconds of this trip. Using that, we could calculated the average on time performance or visualize the number of passengers on the bus. You can take this json data and convert it to CSV using a simple converter tool. You can then import your CSV into a spreadsheet program, like Excel or LibreOffice Calc and create visualizations. For full documentation on the API including all the routes, parameters, and data types, a Swagger file is available. You can also view the documentation online. Th API was written in PHP using the SLIM framework. The source code is available on my dv8-api-server github project. A few months ago, Birmingham, Alabama’s bus system (BJCTA Max Transit) retrofitted all of their buses with a GPS system. Along with this upgrade, they released a website allowing riders and the public to track the locations of buses in real time. The website is backed with a public RESTful API, so I decided I would poll the API to retrieve live information on all the buses throughout the day and store them in a local database. With this information, it is possible to run some analysis on the system. We could look at passenger count, travel time, travel deviation, areas where buses tend to slow down, performance at different times of the day, and a host of other analytics. The first analysis I have done is looking at the time deviation. This is how far ahead or behind schedule a bus currently is. A negative number means it is ahead of schedule and a positive number means it is behind schedule. The general rule is that ± 5 minutes is “on time”. The graph below goes through an entire day looking at all the buses on each route. 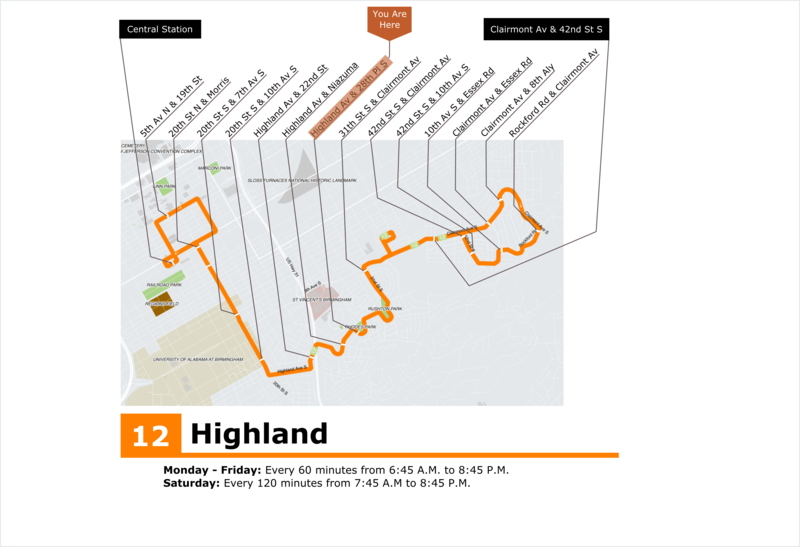 Each route is separated into its own section, so you can clearly see how a single route performs throughout the day. 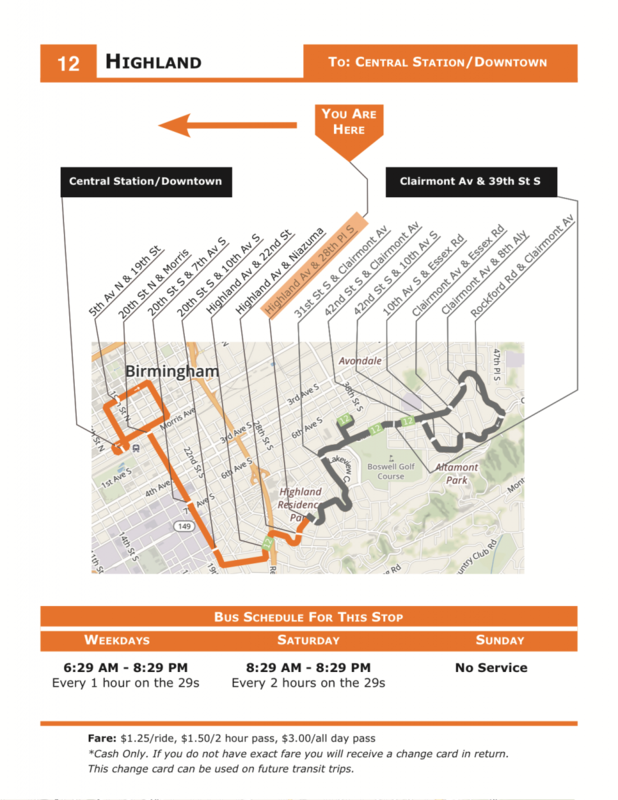 Along a route, multiple buses will simultaneously be making individual trips along that route. Each color represents a different bus making a different trip. Since there is overlap between buses sometimes making it difficult to see where a trip starts and ends, I have placed bars below the graph. Each of these bars mirrors a single bus making a single trip, allowing you to easily see how many active buses there are and when they started and stopped their trip. If we zoom into a specific route, we can get more detail (Click on the image to see the full day). This is line 17 – Eastwood Mall. It is one of the busier routes with several buses making simultaneous trips. 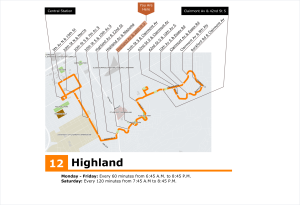 As you can see, most trips start and end on time, however, there is a bit of a peak about halfway through the trips, where the bus is behind schedule by up to 15 minutes. There is quite a bit of deviation along most routes. However, the most important thing to look at is the start and end of each trip, and for most trips, those have a tendency to converge on 0 deviation. This means the overall trip length is as expected, but buses are being held up in the middle of trips due to traffic and other unforeseeable circumstances. I don’t know what happened to the 14 (Idlewild Palisades) around 5pm. I’m thinking the bus broke down and a new bus (purple) had to be sent out to replace it. Some routes are interlined. For example, the 12 and 18. The bus starts off as the 12, does its trip, but once it pulls into central station, that same bus becomes the 18 and does a trip along route 18. When it returns to central station, it once again becomes the 12. It appears as though the 18 is constantly taking longer than the expected time which makes the 12 start late. Even though the 12 makes up time, it can’t seem to ever get on schedule. The 280 runs down a major suburban corridor that has the worst traffic in the region. 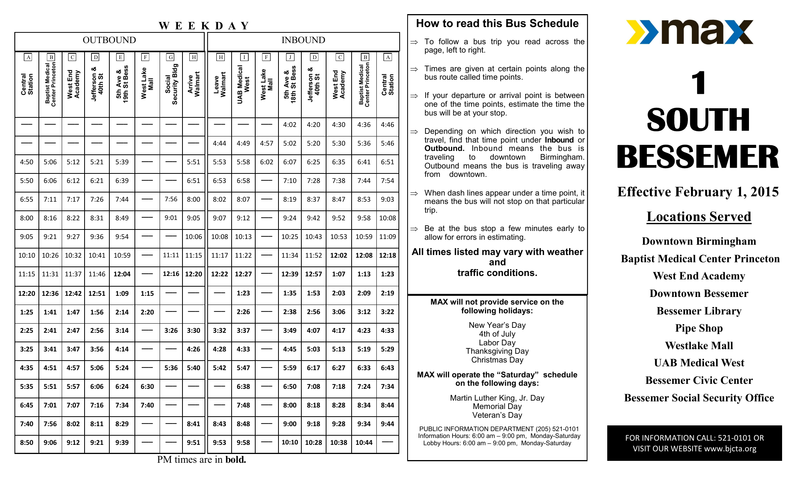 Even during rush hour at 5.00pm, the route is expected to have the same trip time as 10am. Clearly it doesn’t. The most heavily used routes: 17, 1, 3, 44, 45, 6, 28, 8, 1 Ex all have minor deviation and run on time. I’m still cleaning up the code, but it is currently usable. 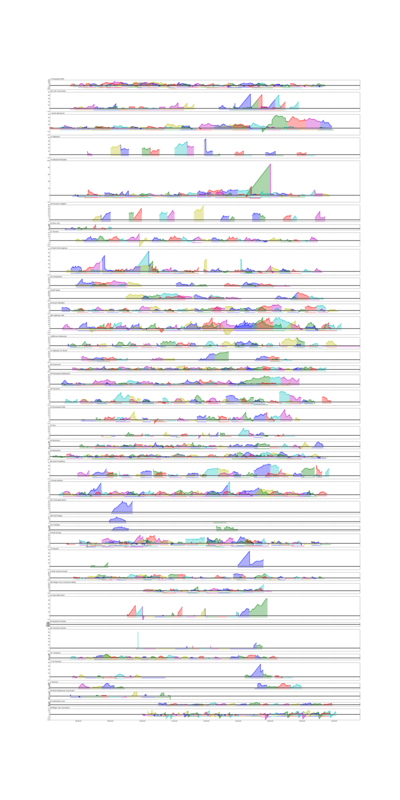 I’m also thinking about porting this to D3 and doing live visualization on a website rather than generating a static image. I have been using all open source software to create these. All the routes and maps have been created using QGIS. Inkscape is used for creating vector designs, and Scribus for the final page layout and designs. I have included all source material in the following downloads. If you would like to add additional locations our new routes, I would welcome any contributions. If you would like to help hang signs on bus stops, Birmingham has over 3,000. I have found that laminating the signs keeps them protected from weather and that they can easily be hung with simple mounting brackets and industrial zip ties. 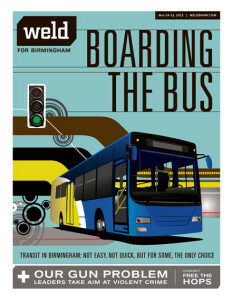 Code For Birmingham has been working towards making transit it Birmingham, AL more accessible. Part of this has been a push on how we can make transit easier for first time riders. A lot of our focus is centered around using technology, from real time tracking to buying bus passes directly on your phone. 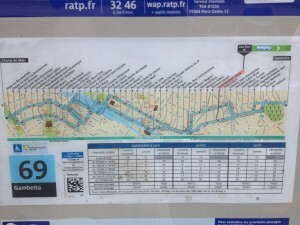 But we need to not forget the most basic thing every rider looks at: timetables and maps! Several graphic designers along with GIS experts from Code For Birmingham, have been coming of with some mock-ups of both new maps and new timetable fliers. 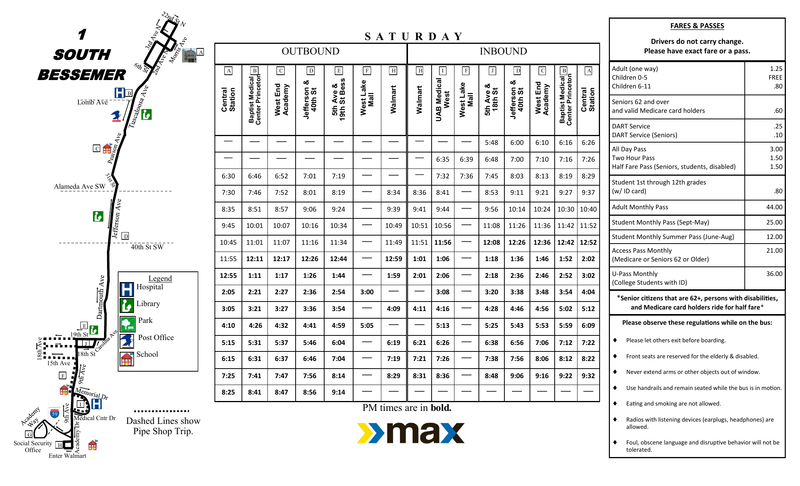 This is the existing timetable for the #1 route to Bessemer. I have found this to be cluttered and difficult to read. 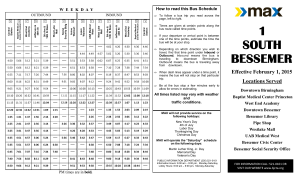 Below is our version of the #1 timetable. The data is the same (this is a mock-up so times weren’t filled in), but we’ve tried to make it easier to read. The locations are clearer and show up directly on the map, as you’ll see below. Instead of using words like Inbound and Outgoing, we are more focused on the starting points and destinations. 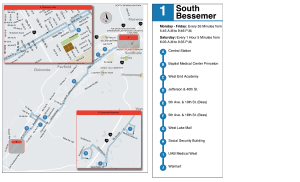 And this is the existing map for the #1 route to Bessemer. Even as someone who is very familiar with this area, I find this map very difficult to read. It is missing all points of reference, distances aren’t accurate, and it isn’t clear that North is not pointing up. This is our version of the map. We’ve overlayed the route directly on top of a street map, so areas of the city are much more clear. 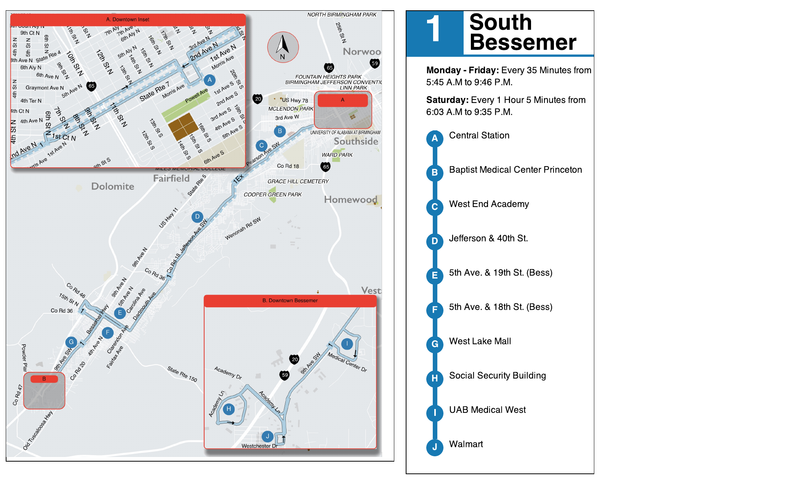 We also have insets to highlight the important detailed areas, like downtown Birmingham and downtown Bessemer. Location points are clearly labeled and correspond with the time points in the time table. 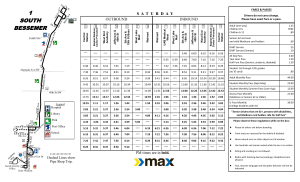 We also have the large “subway style” stop map on the right, with times when the bus runs, frequency, and key stops, so that a user can quickly glance at it and have a basic understanding of the bus route. These time tables and maps above are meant to be fliers given out about the route. But Birmingham is finally in the process of removing a city ordinance that banned any information from being displayed at bus stops (I know crazy, right?). With this ordinance being removed, the BJCTA will finally be able to post route maps and information at stops and shelters. With this in mind, Code for Birmingham starting looking at what information would be useful. 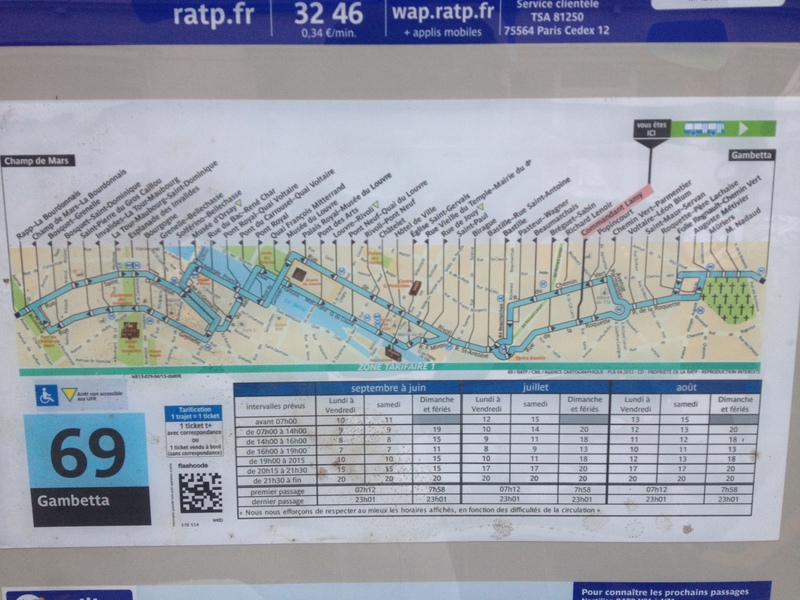 While in Paris earlier this year, I noticed the maps they had at their bus stops. An example of the 69 line is shown below. I found these maps very useful. I tend to be someone who walks in random directions in a city, so I often find myself slightly lost. So when I came to a bus stop that had this map, I was immediately able to tell where I was in the city, what my orientation was, what was nearby, and most importantly, what transit options I had at this location. I was without data on my phone, so it was interesting to get around by bus without having a smart phone to immediately look routes up or get real time trip planning. If I didn’t plan out a route before I left, I would have been pretty lost. But I found I was able to look at any one of these maps and immediately understand the route and availability. 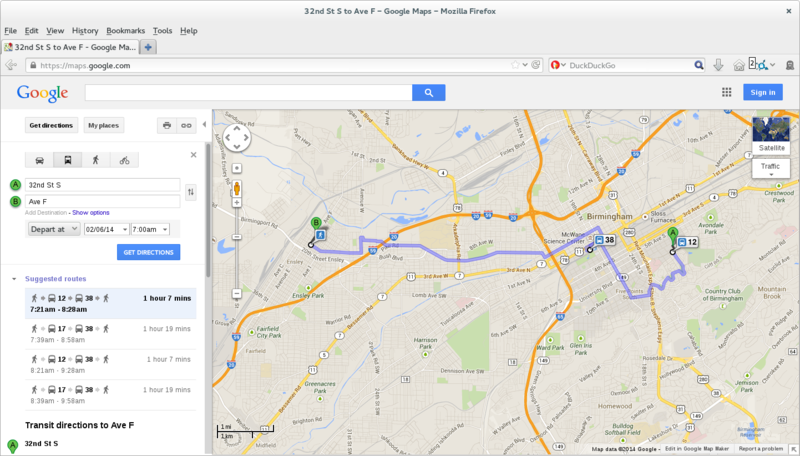 So based on this, I have recreated a short route in Birmingham, the #12. I am not a graphic designer, so I know this could use a lot of work, but I want to just focus on the concept for a minute. I am hoping we will be able to create versions of this for every route, at every stop. Not only will this be useful for existing riders, but I think pedestrians will use them for wayfinding. It will help advertise and market the system, and hopefully, a potential bus rider will see how easy the system is, and use public transit. 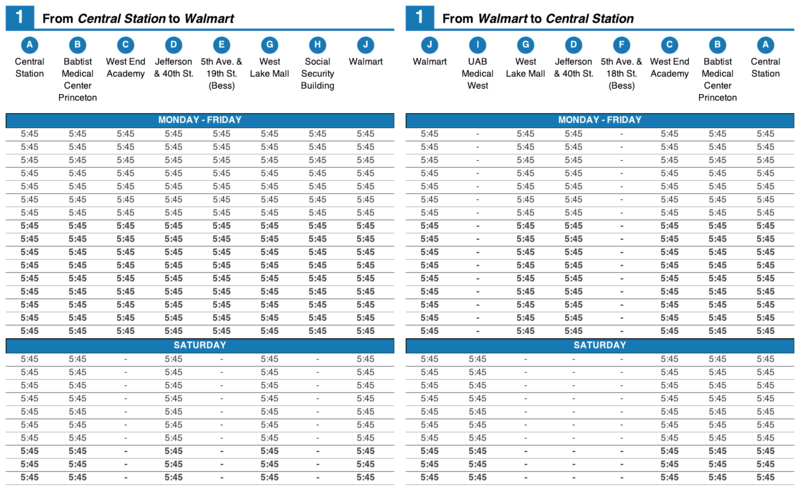 My trip planner for the BJCTA Max buses (http://www.bjctatripplanner.org) along with my android app, are now in sync with the official data from the BJCTA. I will continue to keep my site in sync with their data, which means up to date and accurate data! 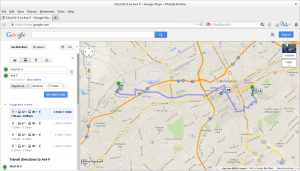 Congratulations to the BJCTA for getting trip planning available on Google Maps. It’s been a long time coming and a lot of hard work, but our transit system has finally caught up with the times. Next up: real time feeds of buses! I have updated the trip planner (http://bjctatripplanner.org). These changes fix several variants of the #1 and include several trips that were missing. The #1 should now be accurate including the #1 express service. The trip planner is already up to date and so is the android app. Hopstop and other 3rd party apps should update over the next week. 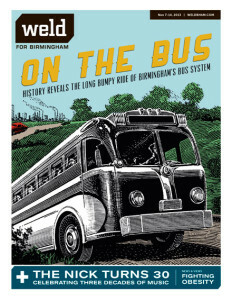 Part 1 is a very interesting look at the decline of the bus system since the 1950s and the turmoil and political games around transit in Birmingham. Part 2 takes a look at what is being done now to improve the system along with stories from riders who rely on the system. Last night I was waiting on a bus in 5 points after some drinks with friends. Among the 12 of us who were waiting on a bus, I noticed two young girls, who we clearly not from Birmingham, looking at their phones to figure out what bus to ride to get back to their hotel near the convention center. As I looked over their shoulder, I saw they were using my App! That right there was enough to make me realize that all the work I’ve been doing for the last 1.5 years has been worth it! So, if you haven’t already, give the buses a try and use my app to help you.